A unique formulation that encapsulates dirt with a lubricating polymer preventing scratches or harm to the paint. 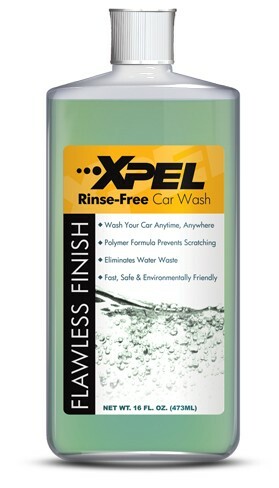 XPEL Rinse Free Car Wash is composed of a unique formulation that encapsulates dirt with a lubricating polymer preventing scratches or harm to the paint. Mix 1 oz with a gallon of water and you have a fast, safe, and effective way to clean your car anytime, anywhere with no mess. Simply wipe on and dry off! This product usually ships within 2 business days from receipt of order.